← What’s Inside New York’s Hautest Egg Roll? 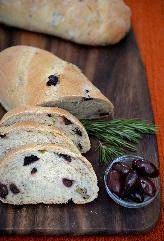 A mix of olives with an undercurrent of rosemary makes a savory loaf that’s a perfect complement to autumn soups and stews. If extending an olive branch is a symbol of peace, imagine the reaction you’ll get when you extend a loaf of savory olive bread, each slice an attractive mosaic of ingredients. On the other hand, if there’s not enough to go around, war may break out. Worth the risk. As with any recipe defined by a main ingredient — in this case, olives — it’s best to seek out good quality olives. Bypass the jars and cans and peruse the olive bars found in many grocery stores, which also lets you buy only the amount you need. While Kalamata are the most common black olives in olive breads, some may prefer the smaller Niçoise with their concentration of flavor. There are a broad range of green olives, from quite fruity to deeply briny. Avoid any stuffed varieties, though; the fillings will create wet pockets in the bread and compete with the olives’ flavor. This recipe uses a mix of purple-black Kalamatas and plump, green Sicilians. Experiment! Some will favor an all-Kalamata loaf, while others go only green. The dough also incorporates some olive oil into the mix. In this case, a basic olive oil suffices because the bread bakes at a high temperature; save your spendier oil for fresh vinaigrette. This recipe also uses a kneading technique that’s becoming more popular, a bonus with this soft dough. Instead of massaging and pummeling the dough on a counter and being tempted to add more flour, place the dough in an oiled bowl, then with wet hands use a stretch-and-fold action, pulling one end up and over, repeating on all four “sides” of the bowl. Do this three times in 15-minute intervals and you’ll feel the dough start to develop its body, becoming smoother and more easily handled. It’s actually pretty cool. (And if that sounds time-consuming, it’s little different from baking several pans of cookies.) Set the dough aside to rise for about an hour, shape and let rise for another 30 to 40 minutes, then bake. Sharing such a loaf with people you love is the very definition of “breaking bread,” which is one of the most peaceable things we can do. This entry was posted in Chalkidiki Olives, Inolivia Kalamon, Inolivia pitted and tagged Chalkidiki Green Olives, INOLIVIA pitted, Inolivia Rich Olive Flavours, kalamata olives. Bookmark the permalink.